Okay, I get it, this combination may sound a little strange. But trust me, it’s SO delicious! This recipe is fairly easy to throw together and even easier to grab one of these cakes for an on-the-go snack or meal. I like eating the salmon cakes over a bed of greens with a squeeze of lemon and a drizzle of olive oil. But this recipe isn’t just tasty. Salmon is a great source of vitamin B12 and selenium. Vitamin B12 is important for proper methylation and energy metabolism. It’s also important for healthy nerves. Selenium is a mineral with powerful antioxidant properties. It’s especially important for proper thyroid function and the production of thyroid hormones. Salmon is also loaded in omega-3 fatty acids, EPA and DHA. Omega 3s also act as anti-inflammatories and antioxidants. They are crucial to brain function and development. If that’s not all, salmon is also rich in astaxanthin, a carotenoid. Astaxanthin gives salmon that bright pink/red pigment it’s known for. But certainly, that’s not all. Astaxanthin has anti-aging and antioxidant properties (more potent than vitamin E!). [1,2] It also increases blood flow and circulation, and studies show it could have heart-protective effects. [3,4] Since astaxanthin is fat-soluble, the fat content in salmon can help you make more use of the astaxanthin and put those powerful anti-aging properties to work. And let’s not forget those sweet potatoes. Sweet potatoes are a great source of vitamin C, manganese and copper. Your body needs manganese for the metabolism of fat and carbohydrates. It’s also used in bone development, wound healing and collagen production. You need copper to absorb and make use of iron. Copper also works with vitamin C to form collagen. Which makes sweet potatoes even more amazing due to the vitamin C, copper combination! I won’t say “no” to more collagen. Okay, now for the cooking and the eating. Using the ghee or coconut oil, grease the cups of a regular-sized muffin tin. Heat a skillet to medium-high heat. Add 1 teaspoon ghee and saute the shallot and bell pepper for 3-5 minutes until they soften. Once finished, remove from the heat and add the shallot and bell pepper to a large mixing bowl. Add all the other ingredients, except the green onion and lemon wedges, to the shallot and bell peppers. Give it a good stir (don’t be afraid to use your hands!) until everything is combined. 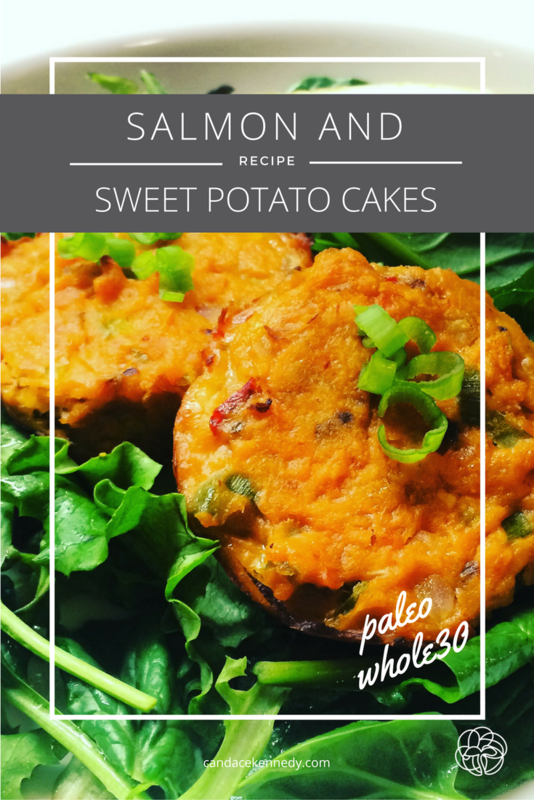 Divide the salmon and sweet potato mixture evenly into the 12 muffin tin cups and press down firmly with the backside of a spoon. Bake in the oven for about 25 minutes (you’ll know they’re ready when you can insert a toothpick and it comes out clean). Wait for them to cool and then top with green onion and a spritz of lemon juice. Yummmmm. Okay. I need to start making things. I’ve been so fearful of canned salmon. Perfect. Thank you. I used to LOVE canned sardines but just got too worried about all the canning process. I’ll check this out!